104- Moses said: “O Pharaoh (Firawun)! Studies conducted on data acquired about Pharaoh thanks to the deciphered hieroglyph script and Egyptological explorations corroborate that what is said about the parables of Moses, and the accounts related to Egypt and the Pharaoh in the Quran, are exact when compared with tangible historical data. The Quran referred to the Egyptian ruler at the time of Joseph as “malik” (ruler, king) but for the ruler coeval with Moses the Quran uses the word “Firawun” (Pharaoh). Pharaoh was the Hebrew form of the Egyptian “Per-ao” (the great house) signifying the royal palace, an epithet applied in the new kingdom and after as a title of respect, to the king himself. Never before had it been used in this sense. To quote the Encyclopedia Britannica: Pharaoh was referred to in narrative as “his majesty” or “the good god” or “the sovereign” as a circumlocution of respect. In accordance with the concept of divine kingship, his person was sacrosanct and his insignia -diadem, crowns, scepters, stateshad magic properties. Fire gushed from the mouth of the serpent on his crown to exterminate his enemies; in the battlefield his power was such that he could wipe out his enemies regardless of their multitude. He was said to be omnipotent and omniscient, the one who had the overall control in his hands and was the cause of prosperity. 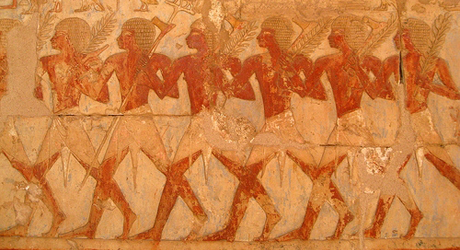 The main source of information is the information that the deciphering of the hieroglyphs made available. However, one should keep in mind that this script had been sunk in oblivion since the 3rd century B.C., to be revived long after. The hieroglyph script that had been forgotten about 1000 years prior to the descent of the Quran was discovered and deciphered after more than a millennium. The Quran relates the events that happened between the Pharaoh and Moses, giving details additional to those found in the Old Testament. What is said about serpents and the prevalence of magic at the time, and Pharaoh’s statement of his divine attribute, corresponds to the information about the Pharaoh revealed from the deciphered hieroglyph tablets. 10: 3-6 Lower Egypt is devastated. The court came to a standstill. Whatever was stored, wheat, rye, geese and fish, perished. and shortage of crops, that they might take heed. arrogant, for they were a people full of sin. 57- So We expelled them from gardens, springs. 59- Thus it was made the children of Israel inheritors of such things. Researchers have devised a course of events that might have taken place in relation to the disasters described in the Quran. According to this fictive account, “The fish in the Nile perished as a consequence of the intoxication of the river, leaving the Egyptians deprived of sustenance. Frogs, whose eggs multiplied in the meantime, invaded the surroundings before they themselves succumbed to poisoning. Decomposition of fish and frogs coupled with the poisonous water of the Nile polluted the fertile land around. Annihilation of the frogs caused the pests like locusts and grain moths to proliferate:” All these are but the product of imagination, surely. We do not know exactly how things happened since we have no available data in hand to make valid deductions. Yet, this account may give us an idea of them. The Ipuwer Papyrus records the curse of blood, drought and disasters to which the Pharaoh’s dynasty fell victim, and the situation of the slaves, who later were to inherit the former’s possessions almost literally as described in the Quran. When he understood he was going to die, the Pharaoh converted. This so-called conversion is not accepted by God, who says that his body shall be saved as a sign for the coming generations. At the time of the Prophet, and for quite some time afterward, people could not have guessed that a science called museology would be developed to harbor objects of historical value, amongst others mummified bodies of the Pharaohs. The Quran’s reference to this and to the people heedless of God’s signs are points deserving attention. The signs of God are many and the majority of people are unaware of this. At the time of the revelation of the Quran, mummified bodies of all the Pharaohs lay concealed in the Valley of Kings along the banks of the Nile. Their discovery took place in the 19th century. The Pharaoh mentioned in the Quran may have been any of them, it happens to be among those preserved in the Cairo Museum, open to public visitation. To the period in which Moses is believed to belong, Rameses II and his son Merneptah correspond. Merneptah’s body bears the traces of fatal blows. It is reported that these marks may have been caused during his drowning or after the recovery of his body, that had washed ashore; the Egyptians mummified him like all the other Pharaohs. The evidence available does not permit us to derive a convincing conclusion about the details of his death. However, no conflicting relationship could be established between the death of this Pharaoh and the account given in the Quran.